Poor Andy Carroll, he misses a great opportunity early on and again his price tag comes up (even when he scores it rarely occurs without being mentioned that it's metaphorically paying off another chunk of his transfer fee). Contrast that with Mark Gower's miss where the reaction is more 'Well that's Mark Gower for you'. The final outcome could have been dramatically altered by either of those efforts going in but ultimately the story of the match was one that even though Liverpool had the majority of chances this was no mis-match. Liverpool had 23 shots (compared to Swansea's 12) but only managed 5 efforts on target. Last week I was tempted to write a preview about the comparative wastefulness of Liverpool (and in particular Suarez) but felt that would just be tempting fate. Sometime soon, it'll click for Liverpool and they'll give someone a real hammering but they'll probably have to wait until they play a team who aren't as comfortable in possession as Swansea. Liverpool had 23 attempts with 5 on target compared to Swansea's 12 with 3 on target. Dyer topped the Swan's shot list with 3 efforts. 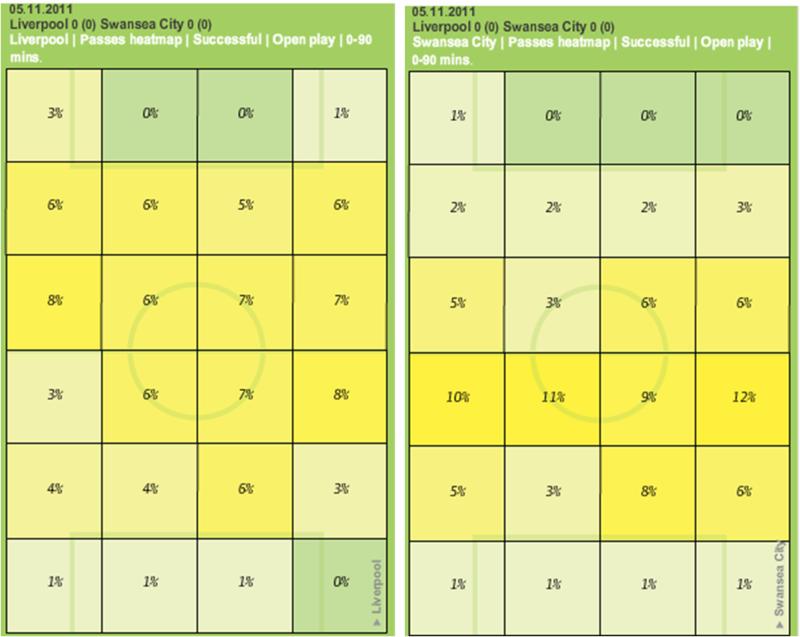 In terms of passing, Swansea almost had parity with Liverpool, making 395 Successful open play passes compared to Liverpool's 424. Top passer for Swansea was Britton, closely followed by Rangel, Gower and Allen. 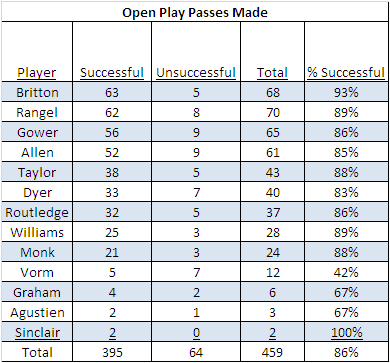 Williams' passing exploits were greatly reduced with only 28 open play passes compared to the colossal 121 against Bolton. Where the passing took place also shows the extra territory enjoyed by Liverpool with 55% of their successful passes taking place in the opposition's half compared to Swansea's 27%. Swansea's defence were also up against it at times making a total of 35 clearances compared to Liverpool's 6. If all the above sounds like I'm downplaying the effort by the Swans that's certainly not the case, at times they bossed the game and have a real composure that only a minority of premier league teams can match. One of the most pleasing aspects of the game was the performance of Wayne Routledge, against Norwich in the attacking midfielder position he looked eager and enterprising but ultimately got crowded out. Being out wide seemed to bring out the best in him and even though it's likely Sinclair will return against Man Utd, it's great that Routledge has shown he's no poor alternative. That coupled with the return of Agustien, the first team return soon of Caulker and longer term dare I say it, the return of Bodde then what maybe seemed a pretty thin squad a few weeks before the season started now has real competition and one that has so far at least, proved itself deserving of being premier league.